It's WED, Eco Day or Environment Day, whichever way suits you. Every year, we celebrate the day that sounds to us most like the one that suits Earth Times. The UN celebrate too, making this one of the most international festive days, apart from those we have "inherited." However, given the state of the environment, and the fact we only started in 1973. The themes of food for all and saving forests are still needing plenty of action. Lives and habitats are disappearing fast in your environment as well as everybody else's. The first action is simple. 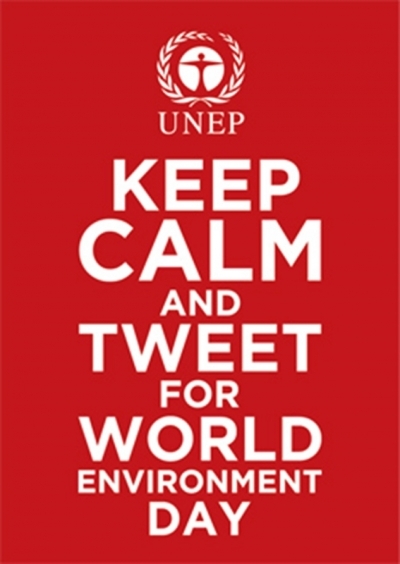 Many haven't got Twitter, so make up for all those who would like to and TWEET for World Environment Day. You can do it now! Barbados is the host country for the UNEP World Environment Day because this year's theme is "Small Islands," Or SIDS (Small Island Developing States.) Sri Lanka is not so small but they are preserving their beaches by gathering all thee plastic that gathers on shorelines everywhere. Other islands are less developed, have little industry and of course have already suffered from the sea-level rise that follows global warming. UNEP call them the canary in the coal mine because of their vulnerability not only to sea-levels, but also to ocean acidification, which means little to many of us. To bring it all home to us, a container ship travelled from China to Europe last autumn. Nothing remarkable there, but it travelled directly across the Arctic North Pole, cutting 14 days off the average journey. The Small Islands are largely looking after their own affairs nowadays. The colonial past is over for most, so they can plan just as Barbados has done, according to their situation. The fragile coral ecosystems can provide great economic benefit, for both local fishermen and multinational tourism. The greener economies they have adopted also suit their peoples. They don't subsidise fossil fuels as many nations still do. Instead of oil and gas drilling, many are investing in renewable energy in the form of solar power. Large countries have rarely bothered to think of sustainability, except during wars, but islands need to sustain themselves on a permanent basis. The UN Environment Assembly will be meeting for the first time ever to discuss how countries are developing financial arrangements for green economies. After that New York meeting, the emphasis will shift properly to the Pacific, for a Samoan September, whose neighbours are all small islands. The aim will be, as it is today, to: "RAISE YOUR VOICE, NOT THE SEA LEVEL." Here are a few challenges for you on - World Environment Day.